Former Brazilian President Dilma Rousseff spoke with Brasil de Fato in an exclusive interview to discuss the current state of affairs in her country. The interview marks one-year since Brazil's first female president was illegitimately impeached as the head-of-state by the country’s politically conservative congress. On August 31, 2016, Brazil’s Senate voted 61-20 to impeach the leftist president for allegedly violating budgetary laws. "They intentionally created a process to have me removed from government. They also bought votes from two hundred and seventeen deputies that have continuously defended the impunity of president Temer," Dilma told Brasil de Fato. She went on to argue that the country is entering the second stage of a "coup", as certain members of the Brazilian judiciary and political opposition parties are seeking to delegitimize and discredit President Lula da Silva in the lead up to the 2018 presidential elections. “Impeachment is only the first stage of the coup. The second stage is very conservative and reactionary, on the one hand, and extremely radical, on the other. The second stage forms part of an attempt to prevent Lula from participating in the 2018 elections by manufacturing judicial "facts" against him,” the former head-of-state said. Current President Michel Temer, Rousseff’s Vice President, replaced the leftist leader in May of last year, when the political trial that temporarily suspended her presidency began. Since Rousseff’s removal, Temer’s government has rolled back many of the policies implemented under her administration that protected workers, women, nature and Black and Indigenous people. His government has one of the lowest approval ratings in Brazil's history. Meanwhile, it is alleged that President Temer negotiated bribes from Brazilian food conglomerate JBS. However, earlier this month, the lower house voted against allowing the Brazilian Supreme Court to move forward with charges against him. Despite having a record low approval ratings Temer has been able to maintain congressional support to block the probe against him. 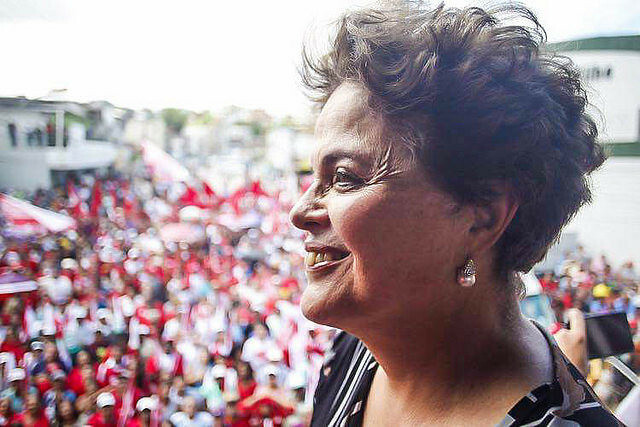 In her interview, Rousseff emphasized the need to implement political reform in the country, which formed a key part of her 2014 presidential campaign platform. She also criticized and highlighted the series of ongoing privatization measures being carried out under the Temer administration such as the proposal to privatize Eletrobras. “This proposal stems from the neo-liberal ideological belief that the state should be removed from all economic activities including the provision of basic services such electric energy," Rousseff stated. Under the previous two administrations, led by former presidents Lula da Silva (2003-2011) and Dilma Rousseff (2011-2016) from the Workers Party (PT), Eletrobras became one of Brazil’s largest utility companies, currently generating around 40% of Brazil’s electricity. “So, this measure is neoliberal in essence. One of the fundamental principles of neoliberalism is to withdraw the state from all economic activities. This is especially true in the area of ​​energy mainly due to its lucrative nature,” Rousseff added. The sale of Eletrobras is still waiting approval from various government bodies such as the special privatization council along with other government and industry regulators. Meanwhile, Brazil’s biggest unions have threatened to continue strike actions, if more workers are laid off at a time when the country is experiencing high unemployment rates of 13%. Exclusive interview | Lula says: "Globo was one of the main articulators of the coup"